pay a traditional pre-flight tribute in front of St. Basil's Cathedral, Red Square, Moscow. Over the last two weeks, ISS commander Butch Wilmore and flight engineer Terry Virts completed three successful spacewalks to install cable, antennae, and other important elements for the continued improvement of the space station. Now, with Wilmore's role in the mission winding down, the crew prepared for three members' departure with tests of the Quest airlock as well as preparations for the Soyuz descent module. Ain't nothin' but a micro-g thing: Flight Engineer Terry Virts at work last week. Wilmore, along with cosmonauts Alexander Samokutyaev and Yelena Serova, will be returning back home to Earth on Wednesday. Their anticipated arrival will land them near the Baikonur Kosmodrome in Kazahkstan, which was also their point of departure several months ago. 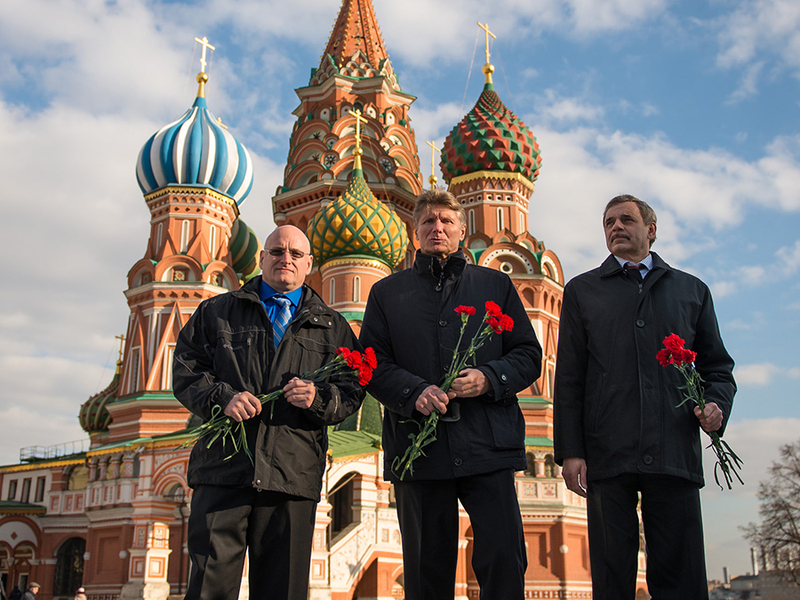 In their place, NASA astronaut Scott Kelly along cosmonauts Mikhail Kornienko and Soyuz TMA-16M Commander Gennady Padalka will head to space in their place on March 27th. Kelly and Kornienko, the "One Year Crew", will spend an entire year on the ISS for the benefits of science and humanity. A major cache of information on the crew's intents for the upcoming mission can be found here. 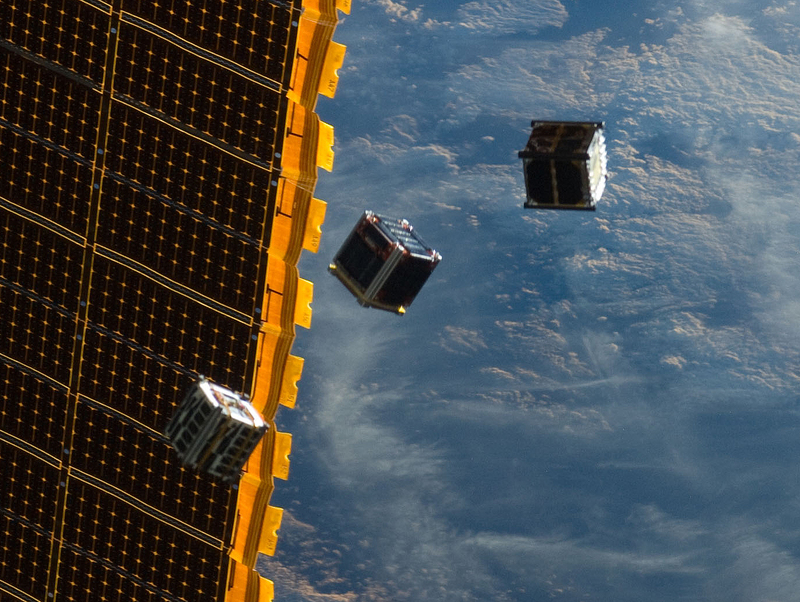 In other ISS news this week, a deployment of CubeSats occurred successfully, dispatching the small satellites into Earth's upper atmosphere. The sixteen satellites, which were launched from the Japanese Kibo module on the ISS, will be positioned to provide an array of data, including capturing innovative photographs of earth, and using microwave scanners to assess major weather phenomena in 3D. Today, for International Womens' Day, NASA paid tribute to ESA astronaut Samantha Cristoforetti and Russian cosmonaut Yelena Serova, both of whom are currently serving on the ISS. An interesting analysis of male vs. female adaptability to microgravity is underway, although serious results will require more women to spend time in space. 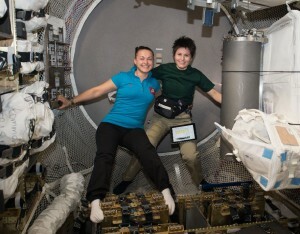 Right now, these two women are just as capable as their male counterparts aboard the ISS, where they "perform experiments in disciplines that range from technology development, physical sciences, human research, biology and biotechnology to Earth observations." They also engage in routine maintenance as well as educational outreach programs while on the job. Great work, ladies! BFFs (Best Floating Friends) Serova and Cristoforetti, representing Earth's females in space. Speaking of change in elements on the ISS, check out this examination of how liquids freeze into solids in micro-g. Yes, many of us are tired of winter at this point, but it's still interesting to learn how exactly these properties process themselves into the microstructures that we are able to observe. Cool. That's all for this week, space fans! Tune in next time to see how Expedition 42's landing went, and what's up next for the ISS crew! Watch this space! The ISS chases the full moon over the Gulf Of Mexico. Video by the homeward-bound Commander Butch Wilmore. Online education is very significant object for everybody without learning you are nothing. An online group is expected to contain a few qualities of an honest group, with extra difficulties comprised by the progressions and by the bodily removing these innovations both agree and cause. It came to my information that my acquaintance advised me to get internationally trusted online life experience degree. Lately I have finished my high education program. This organization also offers a degree of work knowledge.